Home » Formula One: Teen Verstappen signed to Toro Rosso for 2015! 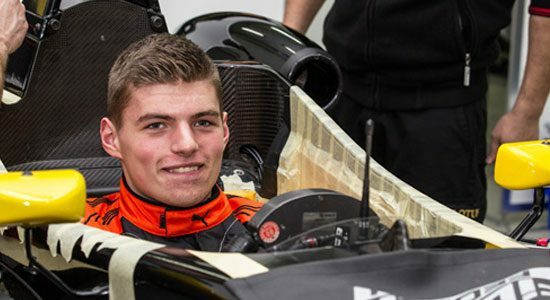 Max Verstappen, son of former F1 driver Jos Verstappen and current rising star in single-seater racing, is set to become the youngest Formula One driver ever after being signed by Toro Rosso to race for them in next year’s championship. Verstappen was signed to the Red Bull young drive programme last year and will partner Daniil Kvyat; who was promoted to a race seat in a similarly surprising manor after graduating from the programme himself. Verstappen’s promotion has taken many by surprise given the 16 year old’s lack of experience. Max is in only his 1st year of single seater racing and has taken part in just 40 races since graduating from Kart racing. Questions of inexperience may be countered by the example of Kimi Raikkonen, who only took part in 23 single seater races before making it to Formula One. His short racing career has been an impressive one so far, with Max taking 6 consecutive race wins earlier this year in the Formula Three championship. Before that, he made a name for himself in karts, become the European and World KZ karting champion. “[We] consider Max to be as one of the most skilled young drivers of the new generation and we believe he has the necessary maturity and mental strength to take on this challenge successfully”. “Bearing in mind that Scuderia Toro Rosso was created with the aim of bringing young talent from the Red Bull Junior Team into Formula One and to educate them,” Tost added, “it will now be up to us to provide Max with a competitive car, which will enable him to have the best possible start to his Formula One career”. Verstappen will be hoping to emulate the performances by Red Bull driver programme graduates such as Sebastian Vettel and Daniel Ricciardo, both of whom have produced excellent drives in the past year’s of Formula One. His father also made an early debut into Formula One in 1994 for Benetton alongside Michael Schumacher. Jos picked up 2 podiums in that year and went on to race for 5 more teams in 103 starts. Max already qualifies for the mandatory FIA super-license due to his participation in the Formula Three championship where he is second in the standings. Upon his F1 debut in next year’s Australian Grand Prix, he will eclipse Jaime Alguersauri’s record as youngest F1 driver at 19 years old as he will only be 17.